In light of the HSE’s (Health and Safety Executive) welding fume reclassification to a carcinogenic, Auto Extract Systems Ltd has concluded on cost-effective options and has concluded that welding mobile extraction units are NOT EFFECTIVE in safely removing cancer-causing gaseous toxins from the workplace as fumes are not vented to the atmosphere (as per the HSE’s HSG258 guidance). There isn’t currently a filter available from any manufacturer that safely filters out or removes gaseous toxins from the welding operations that can safely return clean air to the working environment. Some manufacturers claim that filters are 99% filtration capacity, however, the recognised ‘W3 classification’ standard relates to dust particle size and not the gases it’s filtering; meaning mobile extractors are not effective in safely removing welding fumes from the workplace. Mobile extractors are being sold as cost-effective options, but do not provide adequate LEV (Local Exhaust Ventilation) required in the HSE’s enforcement expectations. This means companies who have ordered or purchased welding mobile extraction units could still be putting their staff at risk by not providing “adequate control” with the use of LEV as recommended by the HSE in the COSHH (Control of Substances Hazardous to Health) regulations. Browse our range of welding fume extraction systems here. Earlier in 2019, the HSE reclassified welding fumes as a carcinogenic and subsequently changed their enforcement expectations on companies that involve welding as part of their business processes (find out more by reading our blog ‘HSE Raise Safety Concerns Amid Mild Steel Welding Fumes Causing Cancer’ blog). At Auto Extract Systems Ltd, we have over 60 years of combined experience in the LEV industry, our experienced team can suitably advise, plan, design, supply and install a competent LEV system that’s tailored for your business’ LEV requirements. We offer free site surveys and quotations throughout the UK and Ireland to ensure we fully understand your welding fume extraction requirements. 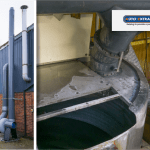 Get in touch today to find out more out the welding fume extraction solutions we can offer to ensure your business complies. Contact us via email, or call us today for a no-obligation discussion on +(0)1942 267444; in addition, keep in touch with us on our social media channels Facebook, Twitter or LinkedIn.